The idea of a warming Arctic leading to more extreme winters in the Northern Hemisphere seems a bit counter-intuitive at fist glance. How could a phenomenon like melting Arctic sea ice – which is, to a large degree, a consequence of a warming Arctic - somehow be linked to colder and snowier winters in Europe, Asia and North America? Diminishing summer sea ice cover in the Arctic is at least in part behind the more severe winters that many parts of the Northern Hemisphere have been experiencing over the past few years, according to a recent study led by Dr. Jiping Liu from the Department of Atmospheric and Environmental Sciences at the University at Albany, State University of New York (SUNY). A specialist in climatology and meteorology, Dr. Liu explains the significant role summer Arctic sea ice cover plays in influencing the weather in the Northern Hemisphere during the following winter. Where did you get the idea to look for a correlation between diminishing Arctic sea ice and colder, snowier winters in the Northern Hemisphere? For the past five winters, many parts of Europe, North America and East Asia have experienced a lot of snowfall and anomalously cold temperatures. We’ve also been seeing a rapid decline in Arctic sea ice extent, most notably the record low we saw in September 2007. And for the past five summers, we’ve seen the five lowest Arctic summer sea ice extents on record. So we hypothesized that there might be some relationship between rapid sea ice decline in the Arctic and increased snowfall during winter over the continents in the Northern Hemisphere. Firstly, the intensive retreat of Arctic sea ice in summer and its slow recovery in autumn can alter atmospheric circulation during the following winter. More specifically, it reduces the westerly winds blowing across the North Atlantic and the North Pacific. As a result, the amplitude of the Jet Stream (a fast-flowing, narrow air current flowing from west to east high in the Earth’s atmosphere) increases. This causes weather systems to move more slowly from west to east. This in turn tends to enhance blocking circulation in the atmosphere, which allows for more frequent incursions of cold air masses from the Arctic into the Mid-latitudes in the Northern Hemisphere. As a consequence, we see anomalously cold winter temperatures in the Northern Hemisphere. Secondly, because of the intense retreat of Arctic sea ice in summer and its slow recovery in autumn, there is more open water in the Arctic Ocean for a longer period of time during the year. This greatly enhances the moisture flux from the ocean to the atmosphere, which increases the humidity of the air over the Arctic. So when this humidity accompanies the cold Arctic air as it makes more frequent incursions into the mid-latitudes due to the blocking circulation process I described before, it leads to greater snowfall in Europe, Asia and North America. Normally colder and snowier winters in the Northern Hemisphere are associated with a negative Arctic Oscillation. But you say in your study that the patterns that have been observed in the Arctic don’t resemble what we normally see during the negative phase of the Arctic Oscillation. Could you explain what you mean by this? The Arctic Oscillation plays in important role in determining weather patterns far away from the Arctic. It switches between a positive and negative phase every so often, and you see different weather conditions in the Northern Hemisphere depending on which phase it’s in. The pattern linked to the reduction of Arctic sea ice in the autumn shows clearly different interannual variability when you compare them to what you normally see during the classical winter pattern for the Arctic Oscillation. There’s a weak correlation between autumn Arctic sea ice cover and what one would normally expect to see during the winter, regardless of which mode the Arctic Oscillation is in. If we look at just the pattern of atmospheric circulation changes associated with the rapid decline in Arctic sea ice, it looks similar to the atmospheric changes seen each time the Arctic Oscillation changes. But if you look at the time series data we’ve collected over the past several years, the year-to year variability is totally different from the variability you normally see with the Arctic Oscillation. The relationship between sea ice variability and the variability in the Arctic Oscillation is very weak. So this strongly indicates that what we’re seeing happening with the Arctic sea ice and the Arctic Oscillation are two processes independent from one another. Is the model you’ve come up with able to project future trends in weather patterns in the Northern Hemisphere at all? We’ve found a relationship between the rapidly declining sea ice and increased winter snowfall over the landmasses in the Northern Hemisphere. But we’re not yet sure if this relationship is due to global climate change or simply due to natural variability. We still need more data before we can determine that. If, for example, year after year we continue to see a robust relationship between rapidly declining sea ice and increased winter snowfall in the Northern Hemisphere, then we’ll be able to say that there’s a very strong probability this is due to climate change, and not simply natural variability. Arctic sea ice will continue to decrease based on current model projections used in the IPCC’s 4th Assessment Report, as well as on improved models that will be a part of the IPCC’s 5th Assessment Report, which is set to be released in 2013 or 2014. Many of these models are predicting ice-free conditions during the summer in the Arctic by the middle of the 21st century. If this is the case, then we’ll probably see more snowfall in the Northern Hemisphere in the winter in the future. We might even see more severe snowstorms. How does your study differ from other similar studies (such as the one by Cohen et. al.) looking at the relationship between the reduction in Arctic Sea ice and increased winter snowfall in the Northern Hemisphere? In Cohen’s study, he and his colleagues took a look at the relationship between anomalous snowfall over the continents in the Northern Hemisphere and its interaction with cold conditions in much of North America and Europe. What we’re looking at in our study is the relationship between Arctic sea ice decline, anomalously cold conditions and increased snowfall in the Northern Hemisphere. Our study goes back one step further in the process. Does your study look at how changing albedo (reflectivity) of the Arctic through loss of sea ice might affect weather patterns? No, we didn’t look at albedo. However we did observational analysis of the sea ice loss and put this data into a model simulation. The model that we used is an atmosphere-only model that incorporates observed ice loss. The model results show a robust relationship between the reduction in sea ice and increased snowfall over much of North America, Europe and East Asia. We see this relationship not only in the model, but also in the observational data. Are we anywhere near a point where a weather forecaster in the Northern Hemisphere might be able to look at sea ice conditions in the Arctic every autumn and be able to predict roughly how much snow there might be in the northern latitudes over the course of the winter? If the relationship we’ve found continues, it will certainly help us to be able to forecast winter snowfall. But we’re not there yet. At the moment we’re trying to build a statistical model to forecast winter snowfall over much of the northern continents. I should point out that we’re basing it not only on Arctic sea ice extent, but we’re also incorporating the Arctic Oscillation, El Niño, and other cyclical climate phenomena. While sea ice plays a dominant role, we have to take into account other processes. So if sea ice plays a dominant role, does it play the most important factor in determining winter weather conditions in the Northern Hemisphere? I think Arctic sea ice plays a key role in determining winter weather conditions over Europe, Asia and North America. Before our study, there were studies by Seager et al, Ratnam et al and Cohen et al that attributed increased winter snowfall to normal cyclical climate phenomena such as the Arctic Oscillation or El Niño. But our study found no robust relationship between these natural cyclical climate phenomena and increased snowfall along with below-average temperatures over landmasses in the Northern Hemisphere. But we have found a robust relationship with sea ice. So we can see that the sea ice plays a greater role in determining the weather than the Arctic Oscillation or El Niño. With reduced sea ice cover in the Arctic, does this lead to a greater heat flux between the ocean and the atmosphere? Did you include this in your study? Yes, reduced sea ice cover does lead to a greater heat flux between the ocean and the atmosphere, and yes, we did include this process in our study. The sea ice acts as a barrier when it’s there. But open water absorbs more solar radiation, and then transmits this heat to the atmosphere. How many more time series would you need to collect before you would be able to definitely say there is a relationship between climate change and colder and snowier winters in the Northern Hemisphere? At the moment we’re using the time series from 1979 to 2010. This is 30 years. Before that, we don’t have direct sea ice observations. But I think 30 years is sufficient, because it gives us a statistically significant correlation. But of course if we could have a longer time series, it would be even better. We definitely need more data. If we see the same kind of trend over two or three more years, then we might be able to say there’s a link with climate change. There has been a persistent out-of-phase relationship between sea ice and snow cover for the past five years. If we see this relationship persist over the next few years, we might have more confidence in saying there is a link. Is there anything you can do to improve your model? Would you need more satellite observations? More in-situ observations? I think we need more satellite observations, as they provide large-scale coverage and more persistent time series. We also need to observe snow cover on top of the Arctic sea ice. At the moment, we don’t have too many snow depth measurements. We can get a good idea of snow cover via satellite, but we need more in-situ snow depth information. Better reanalysis is also needed so we have a better understanding of atmospheric circulation changes. This will be quite helpful in giving us more persistent time series. And of course, better models are always good. We need better representations of physical processes. Current models still have a number of uncertainties. They can’t capture all the relevant physical processes. 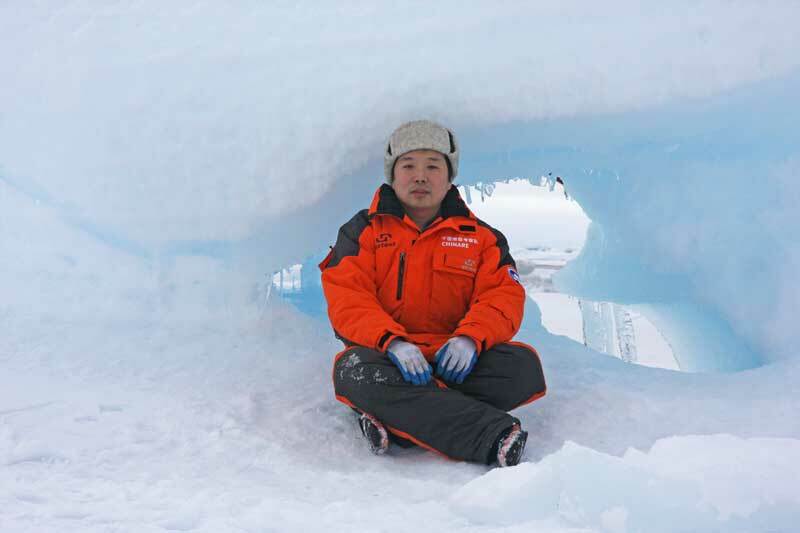 Jiping Liu is an Assistant Professor at the Department of Atmospheric and Environmental Sciences at the University at Albany, State University of New York (SUNY). His resarch interests include how Arctic sea ice extent influences weather patterns in the mid-latitudes of the Northern Hemisphere.